Our old standard Eddie Vegas is listing this new "special ordered" Aged Natural NOS 60. 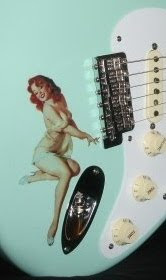 Specs include 7.25" radius, vintage "C" (fatter than modern C), 21 vintage size frets, tinted nitro finish, Custom 60's pickups with 3 pos switch- make it illegal to even sell 'em-- and bone nut. Also included is all case candy, COA and brown tolex OHSC. Ed also mentions that the plastic film is still on pickguard and trem cover. We dig Ed! Besides nice FCS stuff, he always has amazing vintage Fender guitars. He's a long time dealer with high eBay score and 100% rating. Ed includes demo vids for all listings these days. Ya never see his face but he sounds like he could be the grandson of Uncle Charlie from "My Three Sons". Gotta be pretty old to know what that means.